Went to the angels on September 15, 2011. 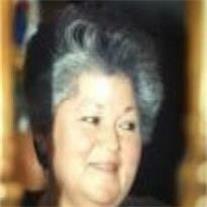 MaryLou Figueroa Medina passed away peacefully in Scottsdale Az. A Native of Mesa Az. MaryLou is survived by her husband of fifty -one yrs James Sezate Medina, Sons James F. Medina Jr., Ruben R. Medina and Stephen P. Medina Sr. also daughters Christina M. Martinez and Stefanie R. Medina. Besides her husband & kids MaryLou’s JOY’s in life were her 9 grandchildren, 2 great-grandchildren, Roy, Marie, Mayra & many nephews and nieces. MaryLou was known for her beauty, laughter and hospitality. She was a strong woman of Faith, family and a friend throughout her 68yrs of life. Many Family & Friends prayed for her health and with the strength of the Lord he answered them and took her home. MaryLou fought the Good Fight she did her best. Now she is with Jesus in peaceful rest. The Medina Family sends a special Thank you message to the Support of The Arizona Kidney Foundation & Davita / Southwest Kidney staff at mountain vista. The courage and Strength of all Kidney Patients is commended. Please join us in celebrating her life September 30 at All Saints Catholic Church 1534 N. Recker Road, Mesa, AZ. Mass at 10:00a.m.Reception immediately to follow until 2:00p.m.